Generates a binomially-distributed pseudorandom pattern whose values are the number of occurrences of an event given the probability of that event occurring and the number of trials. 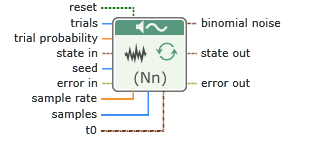 The number of trials performed for each element of the output signal. The probability that a given trial is true (1). trial probability must be in the range [0, 1]. This input is available when you configure this node to return a waveform or an array of 32-bit unsigned integers. ( n i ) equals n ! ( n − i ) ! i ! To generalize, P(X = i) is the probability that i of the n trials equals 1 and n - i equals zero.